Philadelphia – On Thursday, January 28, Philadelphia City Council passed a resolution condemning the Obama Administration’s recent deportation raids focused on Central American refugees. The resolution was sponsored by Councilwoman Maria Quinones Sanchez with Councilwoman Helen Gym as the co-sponsor. The resolution passed 16-1, with only Councilman Brian O’Neil voting against. Councilmembers Quinones Sanchez, Gym, Blackwell, and Jones spoke in favor. New Sanctuary Movement worked with the Councilwomen on the resolution and was be at City Council to show support from immigrants and citizens on this critical resolution. NSM organizer Maria Turcios, who is from Honduras, publicly gave her testimony about the violence immigrants flee in Central America based on the experiences of her family. The resolution weeks after Mayor Kenney reinstated Philadelphia as a “Sanctuary City,” a move that was supported by Councilwomen Gym and Quinones Sanchez. Philadelphia has one of the best local anti-deportation policies in the country. “As the Councilwoman for a district with a high immigrant population I condemn these raids in these raids in the City of Brotherly Love and Sisterly affection and urge the President of the United States to establish a comprehensive national policy to protect and preserve our immigrant families,” said Councilwoman Maria Quinones Sanchez (7th District). 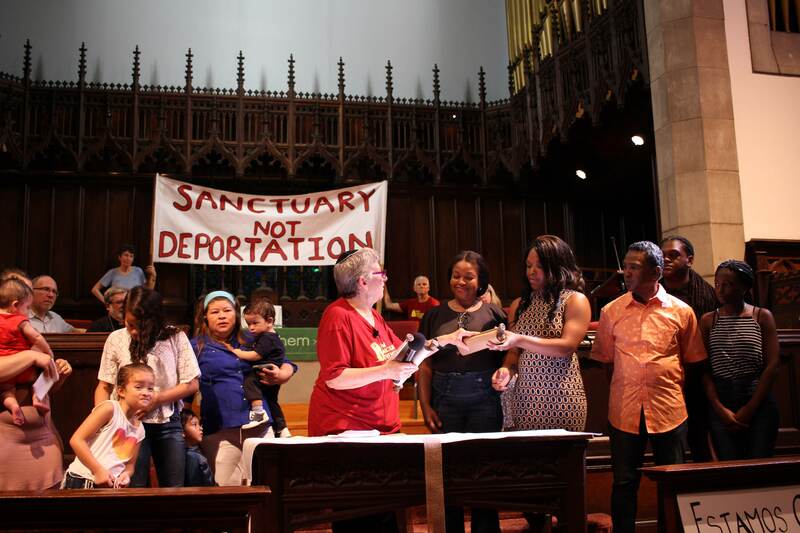 The resolution in City Council comes two days after 275 Pennsylvania clergy signed an open letter calling for an immediate end to the raids, which they called “unconscionable.” Read the full letter with the signatories here. We thank Councilwoman Quinones Sanchez and Councilwoman Gym for their leadership on this resolution, which further demonstrates their leadership and consistent support of immigrant communities in Philadelphia. While politicians like President Obama and former mayor Michael Nutter make deportation political priorities, and Republican presidential candidates run campaigns based on xenophobic, racist hate, we welcome this positive resolution confirming that all immigrants are welcome in the City of Brotherly Love. Urging the President of the United State to establish a comprehensive national policy regarding our undocumented immigrants that seeks to preserve and protect families that have fled to this country from situations of widespread violence and depravation, and to also prevent future deportation raids that tear apart our communities. BE IT FUTHER RESOLVED, That an engrossed copy of this resolution be transmitted to the President of the United States, the Secretary of the Department of Homeland Security Secretary, the Director of Immigration and Customs Enforcement Director, the Field Director for Pennsylvania Immigration, Customs Enforcement Field Director, and the City of Philadelphia Immigrant and Cultural Affairs office.